Power. In this journey, there’s a whole spiral of it waiting for Girl Scout Juniors. The journey is filled with ceremonies and circles, real-life heroines, and special new characters, including the fashion-savvy spider named Dez. 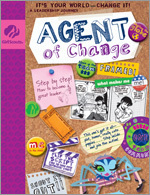 Along the way, girls learn how their own power combines into team power and then moves out to become community power (kind of like how Dez weaves her web from the inside out). The journey’s centerpiece is a comic story of girl heroines who will inspire the Juniors as they take action to improve their own community. To earn The Power of Community Award, girls take action on their plan, reach out, join others and get them involved, and start something that snowballs into a change in their world. Girls join in their Girl Scout Junior circle to reflect on what they accomplished and celebrate it. Juniors build their skills as leaders who Energize, Investigate, and Innovate. Dez, the fashionista spider, is also back to add some wit to the journey as she tries to figure out life "off the grid." "How does this carbon footprint thing work?" she asks. "Do I get eight?" 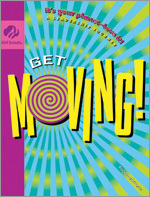 From their own paper-making experiment to making beads from newspapers and magazines to forming a "perpetual human motion machine," Juniors will find that GET MOVING! is crammed full of energizing stuff to make and do! This journey offers Juniors a chance to earn three Girl Scout leadership awards—Energize, Investigate, and Innovate. The girls can choose to earn one, two, or all three. If they earn all three, they'll see how the awards join together to create an energizing effect on their vest or sash. Juniors learn just how many roles are open to them in the world and the possibilities those roles open for them. 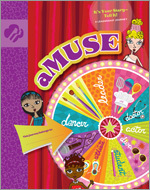 Whether they want to fly a plane, lead a rock band or win a gold medal, aMUSE helps girls take center stage and try out more roles than they ever thought possible, with a little help from Dez and the Muses. As they find out there is more to their story, girls may feel stronger, walk taller and gain confidence!